Erica Reyes, of Hacienda Moralka, believes that the destruction caused by Hurricane Maria also provides Puerto Rico's coffee industry with the opportunity to start again. It was the best crop in years for coffee producers in Puerto Rico like Erica Reyes. As owner of the coffee farm Hacienda Moralka, Reyes estimated that she stood to have a harvest double of what she had produced in 2014, 2015, and 2016. As was the case with most of Puerto Rico’s crops, the coffee harvest was almost completely decimated when Hurricane Maria made landfall on the island on Sept. 20, 2017, rooting out plants and crushing ripened fruits, vegetables, and coffee cherries while flooding lands. A staggering 80 percent of the island’s crops were lost. For the coffee industry, the damage was complete. Nearly 20 million coffee trees were destroyed, with coffee growers overall suffering a total of $18 million in damages. This, when Puerto Rico’s coffee industry was estimated to be worth about $100 million prior to the disaster. In an effort to promote the recovery and growth of the coffee industry in Puerto Rico, Starbucks announced on Sept. 24 that they are donating two million high quality, rust-resistant Marsellesa coffee seeds to the Department of Agriculture in Puerto Rico, to be distributed throughout the island to both larger haciendas and smallholder coffee farmers to assist in the rebuilding process. 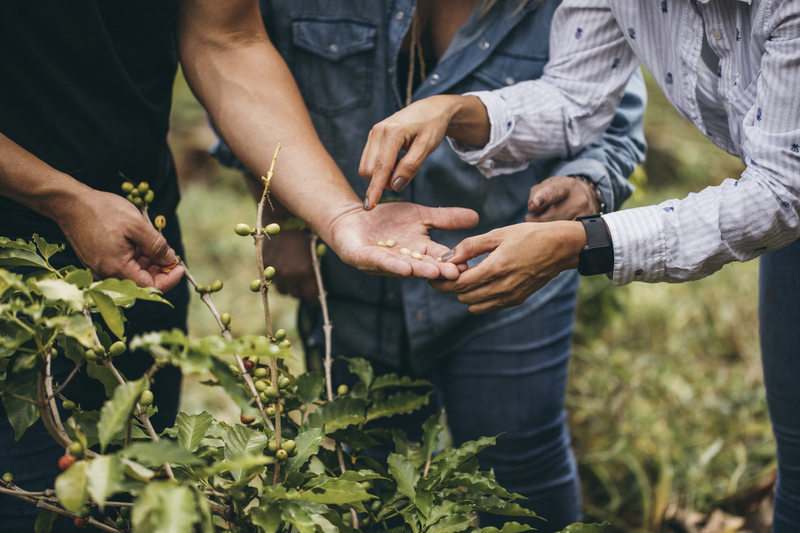 The Starbucks Corporation and EFI Foundation, a Starbucks licensee partner in Puerto Rico, have also teamed up to allocate a three-year, $583,000 grant to World Coffee Research in order to hone and develop growing practices on the island. For Starbucks, it is a move that has been a long journey to figure out how best to support Puerto Ricans grappling with the disaster, an issue “close to home,” said Michelle Burns, Senior Vice President of Global Coffee & Tea at Starbucks Corporation. In the months immediately following the disaster, the company provided funds to its Puerto Rican “partners,” or employees, via a designated fund, called the Tacita Verde Fund. Puerto Rico’s Department of Agriculture is managing the process of distributing the seeds, with a focus on ensuring that the seeds get into the hands of smallholder farmers. “This is an incredible alliance for us, in order to begin,” said Reyes. Like many coffee growers on the island, Reyes is planning to produce considerable amounts of coffee again within three to four years, since coffee seedlings take at least a year and a half to grow before they are able to produce fruit. She also views the destruction wrought by Hurricane Maria as an opportunity to restart and reorganize her farm to make it more effective, sustainable, and competitive to produce quality and profitable products. Burns said the two commitments Starbucks has made to the industry are significant in terms of “enabling and being a small part of the rebuild for people’s lives in Puerto Rico.” Though Starbucks doesn’t currently buy coffee from producers on the island, Burns said that their goal is to support the industry so that it recovers and grows moving forward in the future. The Puerto Rican coffee industry hasn’t exported much of their product since the nineteenth century, but producers have access automatically to a local market, since the island has a high enough demand that it in fact imports about two thirds of its coffee. Reyes is hopeful that the seeds from Starbucks will play a role in rejuvenating the industry and creating a “new beginning for the spirit” of coffee growers on the island. But, she said, it’s a process. “We needed a variety that would be resistant, a variety that had already been tested in Puerto Rico with our climatological conditions, and at the same time would be profitable,” said Reyes, who noted that because the seeds that are being given to the island have already been tested in Puerto Rico, she is more confident in their potential to produce good crops and boost the industry as a whole. Will you one day be able to get 100 percent Puerto Rican origin coffee at your local coffee shop or store on the mainland U.S.? According to Reyes, that’s the dream, and one that in all likelihood can come to fruition with planting the right seeds and watching them grow with patience and persistence.